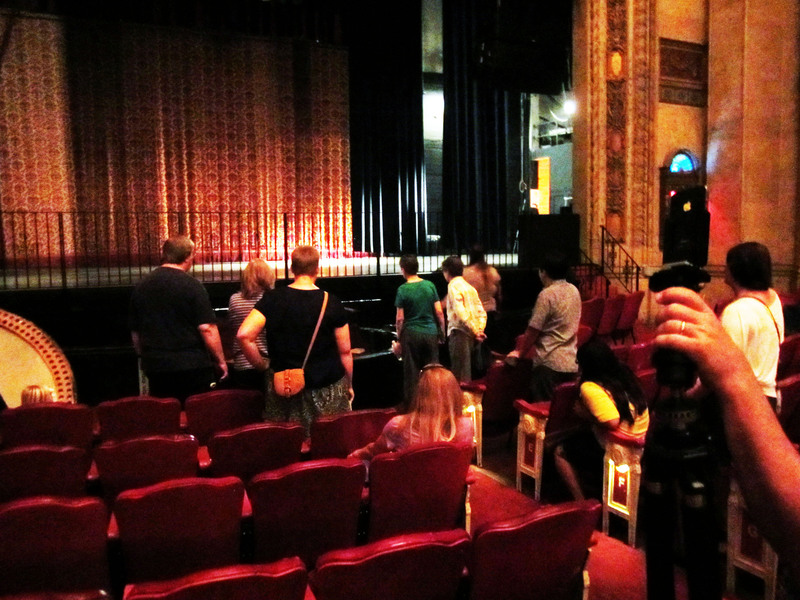 On Saturday August 3rd the folks who joined us for our Yellow Umbrella Tour had a real treat- a full tour of the Warnor’s Theatre, Star Palace and Frank’s Place. 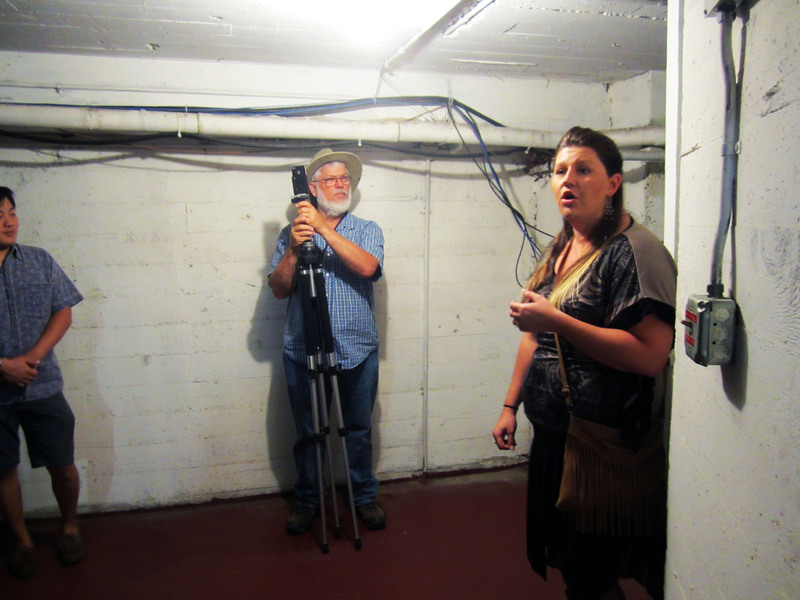 In an attempt to avoid the heat, we’d asked the amazing folks at the Warnor’s Center for the Performing Arts if we could have our tour in the cool of their historic treasure. They said yes, which also meant that I had the chance to play tourist! I’ll spare you all of the Yellow Umbrella selfies I took for my Instagram, so since you’ve all seen the outside- here are a few shots of the inside, and underside, and up above, too! We started in the theater itself. The details are so intricate and very interesting. Did you know that the wood isn’t actually wood at all, but rather concrete and horse hair molded and painted to look that way? That’s why the structural integrity has stood up to years of vaudeville, silent movies, rock shows, Rocky Horror nights, hip hop shows and more. The view from the stage. Breathtaking. The ceiling and chandelier which is held in place by wires and has to be brought down very slowly and carefully by wench to be cleaned or repaired. The hallway with the dressing rooms. Lots of famous people have been in various stages of undress in here. It’s equally thrilling and horrifying all at once. Under it all, beneath the stage and right next to the door for the organist. Those cut-outs in the ceiling that you see are all there for ventilation. Word on the street is that some of them were used by sneaky stagehands to peek up the dancer’s skirts during vaudeville days! This area was filled with big fans to keep the air circulating since smoking was allowed everywhere and it could get pretty stuffy in the theater otherwise. Not to mention this is Fresno and global warming or not, we’ve always had record heat. Our fabulous tour guide- Warnor’s Volunteer Coordinator, Michelle. Warnor’s is a non-profit and all of the great things they’re able to accomplish are volunteer powered. If this sounds like something you could get passionate about, get in touch with her. She’ll put you to work! Further into the underbelly. Controls for much of the complex can be found in the brightly colored room. I just posted this because I think it’s amazing how ingrained it is in our nature to crave order. Look how everyone is behind the yellow line, without any direction to do this. Humans are just fascinating as the structures we build and preserve! This was the coolest part of the tour for me- I had no clue this man-lift even existed here. I’ve walked past it for years and never questioned it. And wind up on Fulton Street right in front of All Things Fresno! Crazy! And then up the flight of stairs into Star Palace. Check out the view. Imagine how gorgeous it must be at sunset. They do weddings… just sayin’. If you’ve gotten your tickets to the upcoming Jimmy Eat World show, you’re going to find yourself in The Middle of this awesome space. Hear You Me, it’ll be absolute Sweetness. If You Don’t, Don’t fret, there are all kinds of other great shows. Man, does this sound like A Praise Chorus for the virtues of Star Palace, or what? Finally, we ended at Frank’s Place which is fast becoming the venue to frequent for all kinds of great local acts. This weekend, don’t miss Fatty Cakes and the Puff Pastries EP Launch party! If you missed this tour and you’re excited to check out the Warnor’s, they hold tours every Art Hop, complete with an organist showing off the full range of the beautiful pipes and everything! 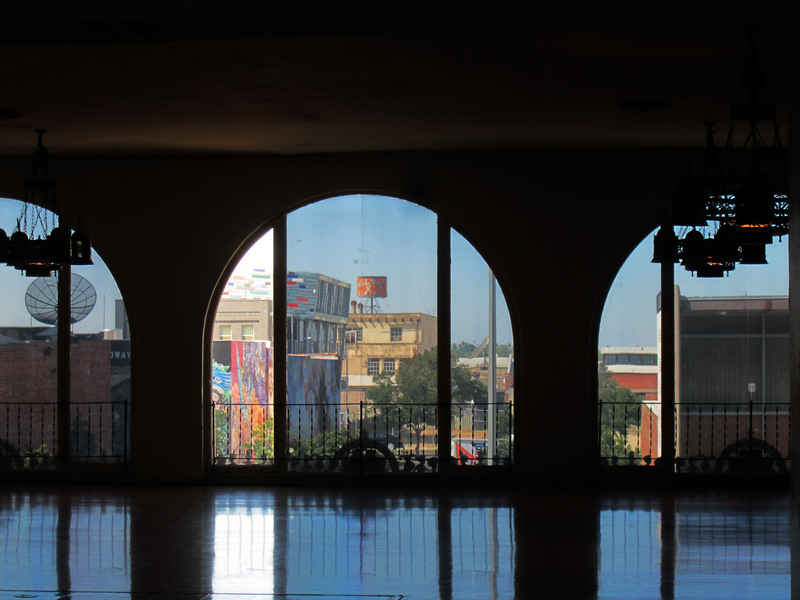 Also, join us and Spectrum Art Gallery on August 10th for a photowalk. 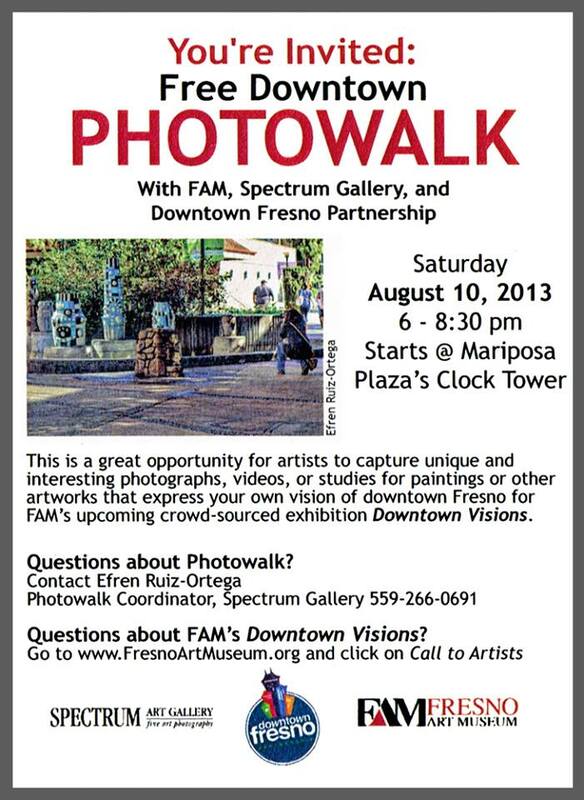 Starts at 6:00 PM and meets at the clock tower on the Fulton Mall at Mariposa.